Over a year ago, I promised my coworkers that I would bring in some homemade monkey bread for them. Today, they finally got it. What happened in between? Mostly, a lot of excuses, like, “I can’t bake monkey bread this week, I’m trying to eat healthy!” and “Monkey bread is off this weekend guys, I have to make Peppermint Mocha Sundaes.” This week I decided to cut the excuses – I put “make monkey bread” in my calendar for Thursday night, I came home from work in the 5 degree weather, and I did it. 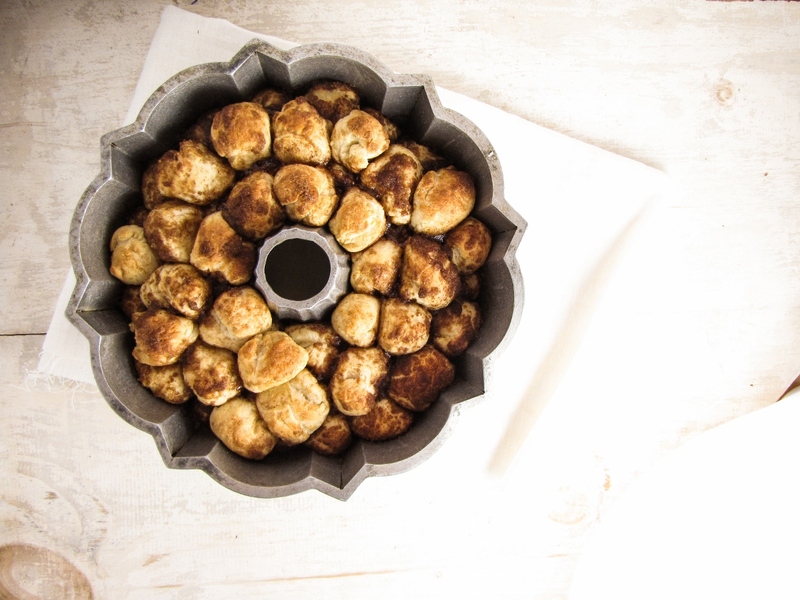 Monkey bread, for those of you who don’t know, is like a bundt pan full of a hundred tiny cinnamon buns that have been drenched in butter. As you might be able to guess from the description, it’s pretty much hard to go wrong with it. Most versions use canned biscuit dough as the base, but I decided to go fully homemade and make the sweet bread dough – thanks to my bread-baking mother and boyfriend, I don’t have a fear of making yeasted things. Actually, I think it’s pretty easy, and I think you will too. Plus, since you’re covering this particular bread in cinnamon-sugar-butter, no one is going to notice if you didn’t let the dough fully complete its rise. My coworkers devoured these in a matter of minutes. So quickly, in fact, that I had to promise to make another batch next week for the people who didn’t get to try any. Also, Trevor just threw a mini-fit when he found out I made it and he didn’t even get a chance to sample some. Like I said, it’s hard to go wrong. Give this recipe a try – maybe this weekend, to ward off the cold – and people will love you. P.S. You have until midnight tomorrow to enter my chocolate giveaway sponsored by Lake Champlain Chocolates! P.P.S. WordPress just informed me that today is my 3rd blogging anniversary. 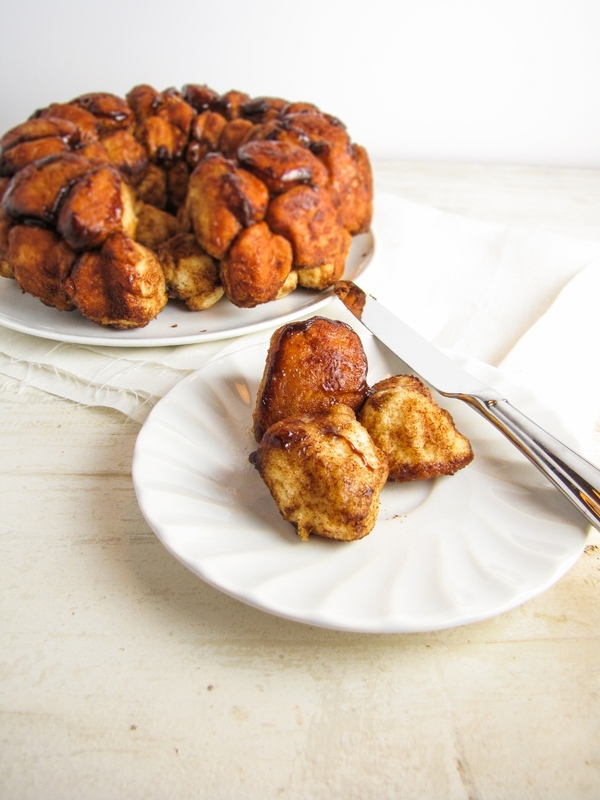 Consider this monkey bread a celebration! Adapted slightly from Cooks’ Illustrated, via Mel’s Kitchen Cafe. Serves 8-10. Note: I got away with using a few tablespoons less butter than the original recipe called for (I melted the full 8 TBS, but ended up with a few leftover), so I’ve listed the amount I used below. If you run out of butter for dipping, just melt a little bit more. Also, I don’t have a stand mixer so I make everything by hand – if you’re lucky enough to have one, check out Mel’s Kitchen Cafe for instructions on making the dough with one. In a medium, microwave-safe bowl, mix 2 TBS of the butter, 1 c. of the milk, and 1/3 c. water. Microwave on medium for about 90 seconds, until liquid is warm to the touch (but not hot), and butter is mostly melted. Stir to incorporate the butter. If the liquid is too hot, let cool until it feels warm to the touch (liquid that is too hot will kill the yeast). Stir the 1/4 c. of sugar into the warm milk mixture, then sprinkle the yeast over the top of the mixture. Let sit for 10 minutes. Yeast should begin to bubble up as it sits. In a large bowl, mix together the flour and the salt. Make a well in the middle, and pour in the milk-yeast mixture. Stir to incorporate, then knead with your hands until the dough is smooth and elastic. If you took the dough out of the bowl to knead it, return to the bowl, cover with a towel, and let rise in a warm place for 1-2 hours. Remove the risen dough from the bowl and shape into an 8×8 inch square. Use a knife to cut 8 lines across the top of the dough, rotate 90 degrees, then cut 8 lines in the other direction to form a cross-hatch pattern. You don’t have to cut all the way through, just mark the squares. Pull the squares off one by one and roll into small balls. Set the balls aside – you should have 64 of them. Melt the remaining 8 TBS of butter in the microwave. Use a pastry brush to brush some of the butter on the inside of a bundt pan. In another bowl, stir together the brown sugar and cinnamon. Dip each of the balls into the melted butter, then into the cinnamon-sugar mixture, then place into the bundt pan. Try to fill the bundt pan evenly with the balls. Cover the bundt pan with a towel, and let rise 1-2 hours in a warm place. Preheat the oven to 350°F. Remove the towel, and bake the monkey bread for 35 minutes. Remove from oven, let cool 5 minutes, then turn out onto a plate while it’s still warm. Don’t let it cool completely in the pan, or it won’t come out of the pan easily. Mix together the remaining 2 TBS of milk and the confectioners sugar and drizzle over the warm bread as a glaze. Serve warm. Oh man… my college dorm used to have open houses with monkey bread hot out of the oven. There may have been fights and diving across tables involved. Miya! Oh my god… I was just thinking how this takes me back to Leverett House! This looks delicious! Happy 3yr blogiversary! 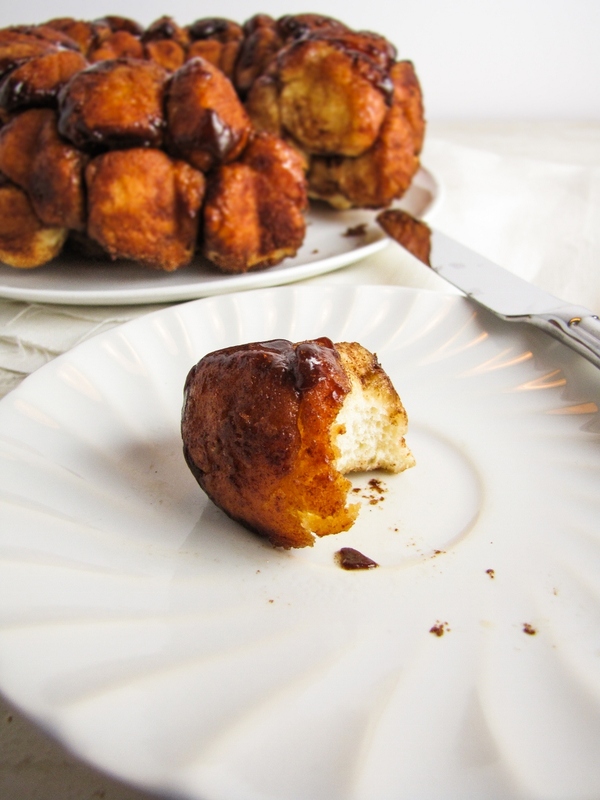 I never knew what monkey bread was (though I kept hearing about it), then a relative brought it to a Christmas party a year or so ago and I was amazed at what I’d been missing! For sure, all your coworkers will give you a great evaluation after this! Katie – Love the monkey bread! I am not gonna lie, growing up (and still to today because my brothers don’t know the difference) I tend to make monkey bread from the refrigerated biscuit dough :) Any way you shake it…monkey bread is the best! Yeah, I definitely considered going the biscuit dough route, but I decided it would actually be more trouble to go and GET the biscuit dough since it was so freezing out. So homemade it was! I’m not sure you’d really be able to tell the difference… the butter and sugar kind of takes over the show. Obviously there weren’t hundreds or I would have gotten some. What a delicious looking bake you have there! I’m loving this post! 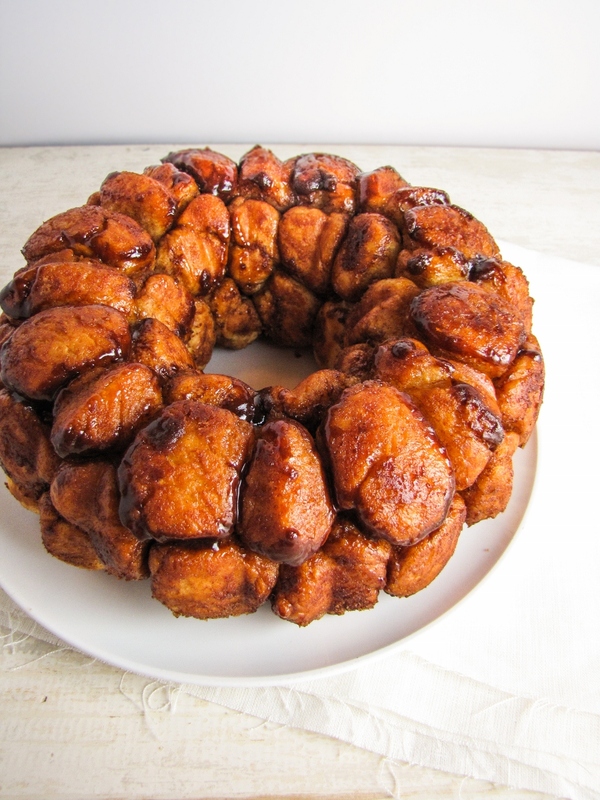 I had never heard of monkey bread before or tried it but it looks delicious and I’ll just have to have a go. My husband makes bread all the time so yeasty things don’t care me either. Thanks for the yummy recipe! Oh wow. That cinnamon sugar goodness looks amazing. I’ve never had monkey bread but I might just need to change that! It’s definitely something you should try at least once in your life! Oh my god. Monkey bread was a staple on my college dorm. This really takes me back. I can’t make monkey bread. Because I can too easily convince myself that it’s too messy to share. And then….you know what happens.